And while we’re on the topic of refugees, let’s not forget about a four decade-plus ongoing refugee issue in Western Sahara that began following its 1975 independence from Spain and its subsequent struggle for nationhood against the Kingdom of Morocco. 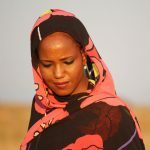 Aziza Brahim is a Sahrawi singer-songwriter who has spent most of her life exiled from her Western Sahara homeland, and she has not forgot. Lagi: “Ever since I arrived in this world I have lived as a refugee / Despite moving to the North I have remained a refugee / Living in a haimas (tent) worn-out by time the haimas a witness of my sensibility and faith. / Look how many souls desire / to finally meet again the eyes that await them / Here they are in Ivory Coast, they are refugees / Every year we see it in Sudan, a nation of refugees / In any town of Palestine here they are refugees/ The troubles are repeated in Mali, they are refugees / And the people here they are, injured, in Argelia, as refugees / And the Saharawi resist today in Argelia, refugees.” Translation: Glitterbeat. Born in refugee camps bordering Algeria, and then exiled to Cuba, where she received secondary education but was denied higher education for music, she now makes her home in Barcelona and performs all over the globe. Yet her music speaks to the issue of displacement, not just for her Sahwari people, but for everyone forced by war from their homelands. Julud, A song about Aziza’s mother: “You are like the night and the stars/ Your voice goes beyond the top of the clouds / You are the smiling breeze of today / You are an example of humanity and of fight. Resist, immortal, resist.” Translation: Glitterbeat. As you may be aware (I was not), Western Sahara was a conquest of Spain since the mid-1800s turning administrative control over to Morocco and Mauritania in 1975. 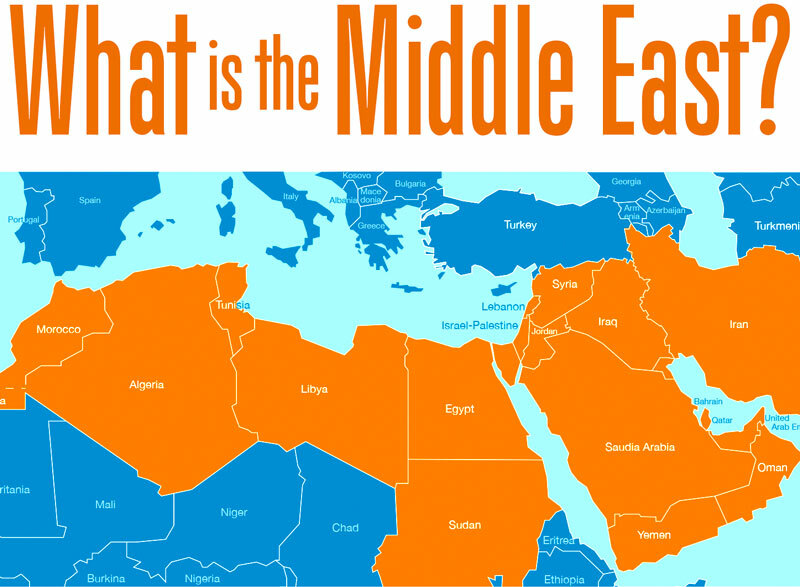 Like the French colonization of Morocco, Algeria, Syria, and Lebanon; the Italian colonization of Somalia, Ethiopia, and Libya; and the British colonization Egypt, Palestine, and India; Spain’s presence in Western Sahara was a display of power and authority aimed more toward competitive imperialism, human exploitation, extraction of resources, and less about increasing quality of life. The Spanish relinquished control, in part, due to the Sahwari Polisario Front, who began as a nationalistic student movement and quickly transformed into a political-military entity when Morocco, in partnership with Mauritania, invaded Western Sahara for annexation. 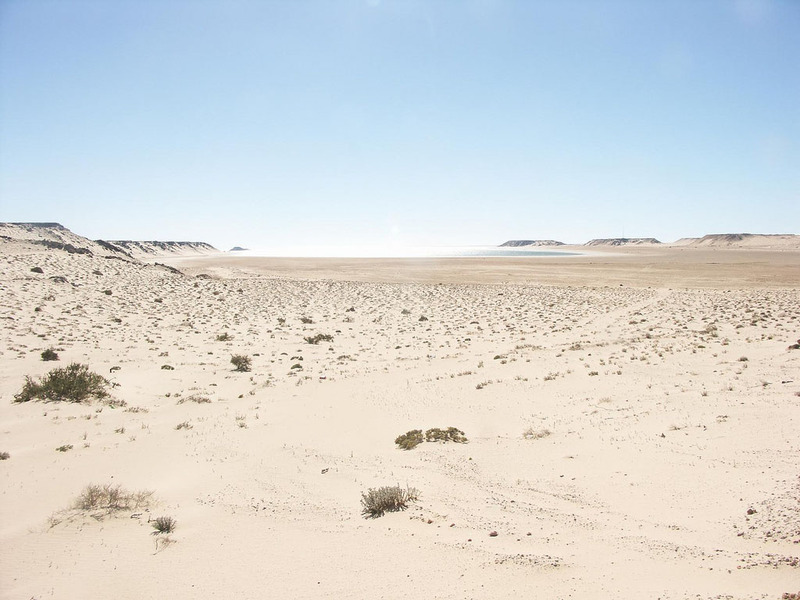 Western Sahara, at first glance, is not exactly the land of milk and honey. 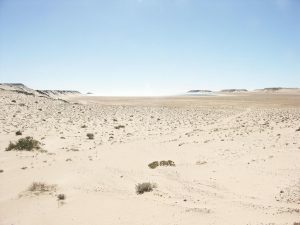 It is a rocky, sometimes featureless desert terrain that is perhaps one-fifth farmable land. However, it does have desirable natural resources, most notabley, phosphate, and it is presumed to have offshore oil and gas deposits that are not exploited because of Morocco’s ongoing illegitimate and unrecognized occupation of it. Western Sahara has a significant fishing industry too. It is one of the most sparsely populated places on earth, with just over half a million souls for 130,000 square miles, or roughly 4.5 people per square mile. Why Morocco wants Western Sahara is a blurry issue: both Morocco and Mauritania maintain parallel arguments that Western Sahara was previously part of their respective domains and should be rightfully reunited. This idea, by the way, is not entirely unlike Syria’s ongoing effort to reunite Bilad al-Sham — the Levant: Syria, Lebanon, Palestine, parts of Iraq, and Jordan — into the single geographical-cultural unit it was prior to Briton Sykes and Frenchman Pikot carving up the region for each countries’ colonial intentions. In short, both Morocco and Mauritania offered historic geographical history as their rationale annexation of Western Sahara. Los Muros (The Walls): “Another fleeting star was seen / Crossing the wall tonight, Undetected by the radar, Unnoticed by the guard. On the land and the sea / The walls keep rising still.” Translation: Glitterbeat. However, much of the world has not looked kindly on Morocco’s invasion. 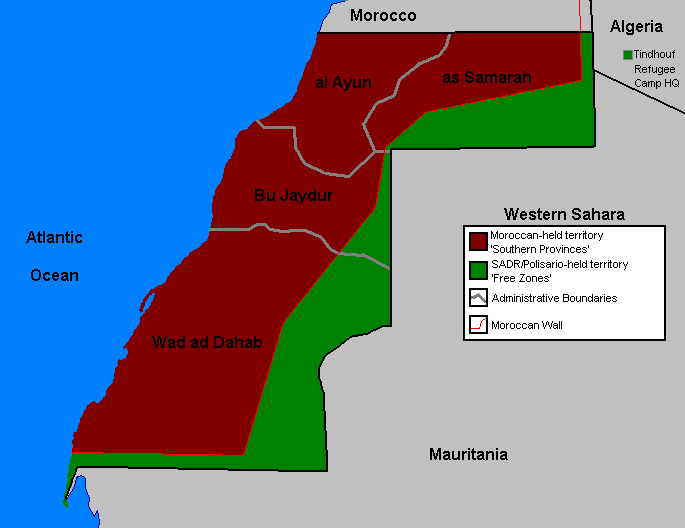 In 1975 the United Nations did not legitimize Morocco’s effort with the International Court of Justice determining that, historic connections aside, the Sahwari had rights of self-determination. And only recently in 2016 the European Union stated that Western Sahara is not part of Moroccan territory. Yet Morocco is steadfast in its occupation, and the conflict has generated refugees — and continues to do with a current estimate of 1.9 million of them, according to Wikipedia. 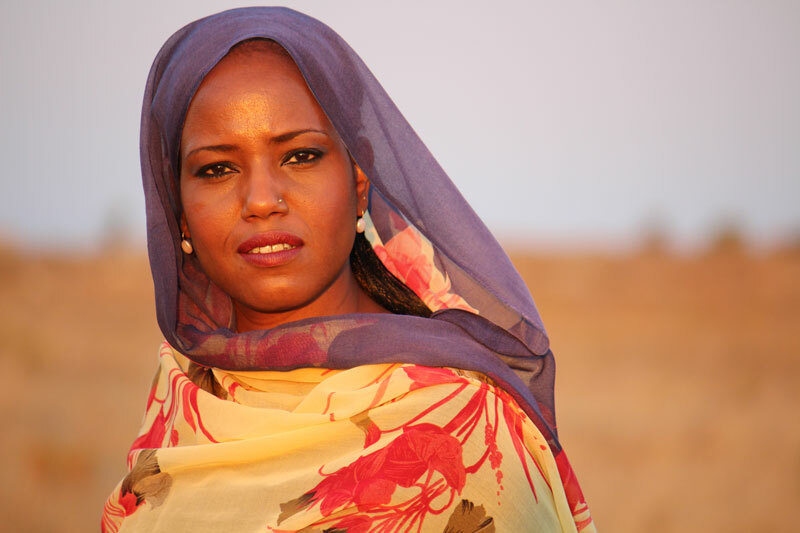 And this is what drives Aziza Brahim to write and perform songs that respond to exile. I’m not able to separate politics, cultural and personal concerns. So, the focus of my music is all of these areas at the same time. 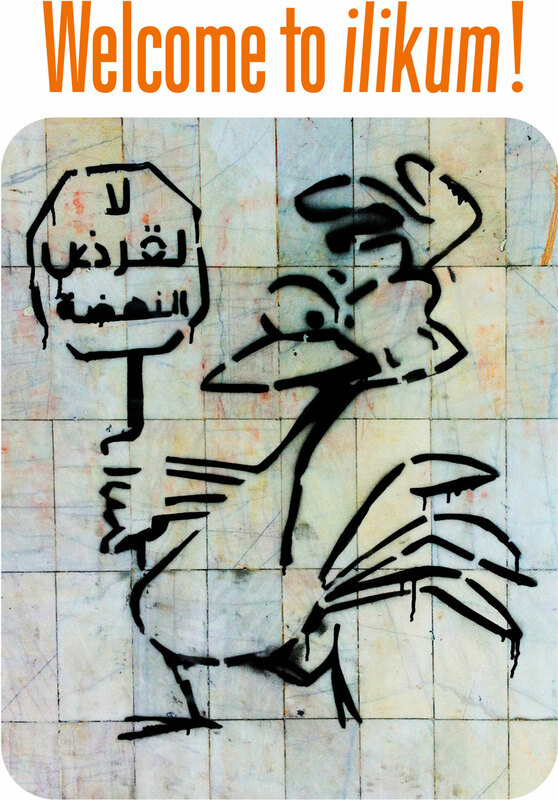 Political, because of its commitment to the denunciation of social injustice. Cultural, because it searches for new musical ideas. Personal, because it expresses the worries of a person that aspires to live with dignity in a better world. Calles de Djla (Streets of Dakhla): “The streets of Dakhla, In the city and in the campsites, Have awoken decked in old banners and placards. In the inaugurated plazas, People gathering together Full of joy, filling up every corner. Oh, all these colours and melhfas, And the remarkable blue of the darrahs.” Translation: Glitterbeat. 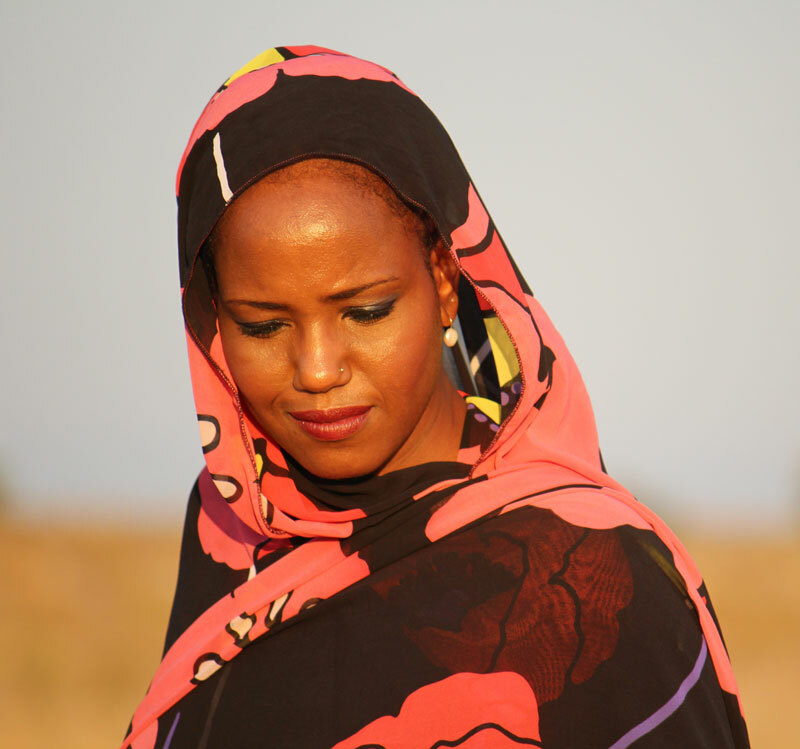 By using song and including international musical talent, and by performing worldwide, Aziza Brahim penetrates multiple cultures to bring awareness to forty years of refugee suffering that has largely gone unrecognized in the wake of other global issues, but awaken us she has. Further, she has leveraged the Sahwari plight to shine a spotlight on refugees in exile everywhere, and her use of music enables us to understand and build empathy for those without a home. Amazing artist. Sad that great artist like her are born in refugee camps, and thrown out of their country because of political conflict and greed caused by a small group that doesn’t represent the majority. With all due respect, in my opinion, the Polosario are not victims. They are a big part of the conflict that is going on western Sahara. The King of Morocco reach out to them peacefully several times, however they used external powers from Algeria and from Libya under Gadhafi regime to escalate the conflict instead of seeking a peaceful resolution and accept that they are part of the kingdom of Morocco. There is no doubt that the Western Sahara is part of Morocco, and the conflict is raised and caused by the Polisario. Thank you Wissal — I have just read this article on Aljazeera and it underscores Morocco’s dedication to Western Sahara’s inclusion into Morocco. Can you say more about why Western Sahara should be part of Morocco’s kingdom?